Wells are steeped in history. There are loads of things we still do not understand about them, the more we learn the more questions we have. There are 3 types of wells. Spring, hand dug and natural dug. A spring is an aquifer which breaches the surface and water runs freely. We are able to capture the water and enable good use of it. There are many houses which depend on springs for all their water usage. A hand dug well is in the name. It was hand dug by well diggers. Many would see a well digger as poor but it was a fairly high paid job. Certainly not bank manager money but it kept food on the table and a roof over the heads of their family. It was a very dangerous job and the death ratio was every 2 in 5. Without well diggers people had no water so they were always busy and in demand. 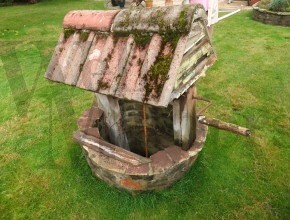 A natural dug well is a well which the water has naturally eroded the well towards the surface. They would find this by either a spring at the surface or using dowsing rods. Well diggers would then dig down and find it and brick line the first few meters which they had dug. The rest of the well would not be lined and would be the natural geology lining. These are usually very deep and can be as deep as 60 meters plus. There were good well diggers and there were bad well diggers. Pretty much as with every trade. 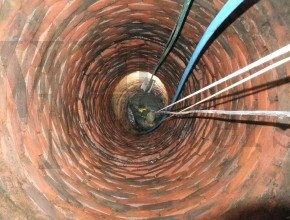 We have seen some excellent wells with extremely good brick structures and straight. We have also seen some that are completely crocked, do not go down straight and are very unstable and require us to repair them. There were also people known as well scrubbers. They would come in every 5-10 years after the well had been dug and every 10 years after that to clean/scrub the well to ensure it was safe to drink and also still in perfect working order. Well scrubbers were usually children, I guess they were given a choice, either up the chimney or down the well. During the wars it was found many women became well cleaners because most of the men who had either dug or specialised in wells were not around and had gone to war. After the First World War well diggers were just not as experienced and the quality of them dropped dramatically. Then after World War II mains water was becoming very common and the job died out leaving very little to no history about this fascinating job which if you look at any well today is a work of art which lays forgotten. When you think most wells are over 200 years old it just shows how good they were at building them.